I finished rereading The Fault in Our Stars for my book club meeting next week and my soul hurts. I know it’s a young adult book but honestly? It’s a heart wrenching, soul hurting, beautiful love story. This is my second time reading it and it hit me just as hard. It just makes you think about life and love and everything. I know the movie version is coming out soon and I also know that I will need a box of tissues with me (not joking) if it’s anything like the book. I also just watched the season finale of Scandal and I’m in shock. I don’t think my brain quite knows what’s going on. Especially because I was so exhausted I didn’t quite remember what happened between 4:30 and 7pm. I think I was napping and watching Mad Men on and off, but I can’t be certain. 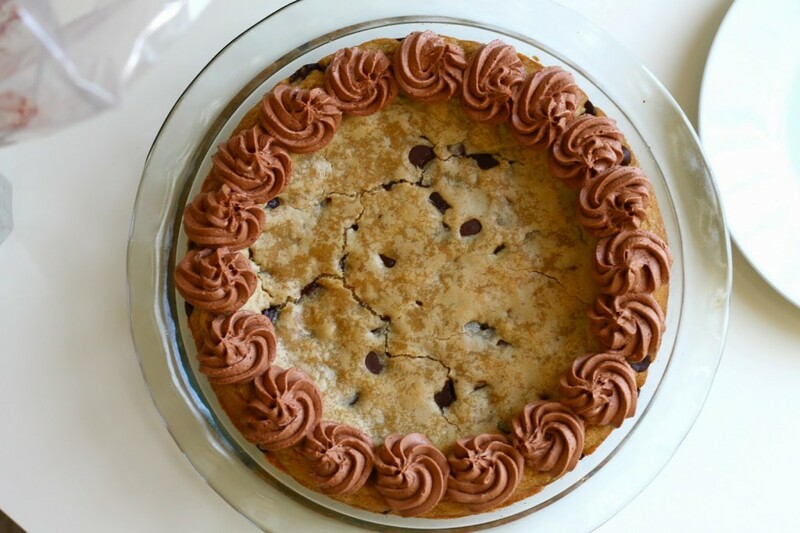 Something my brain does know is that cookie cake is a happy and good thing. I’ve put off making and posting about this for a few weeks now, because my friend Alicia wasn’t eating sweets during Lent and she made me promise. So promise I did and this past week I brought cookie cake to our weekly night out. She talked about how it was such a part of her childhood and I realized how true that is. I remember walking through the mall and while I never wanted to buy one, there was a cookie cake shop/kiosk thing in the mall that sold them. I don’t think they sold anything else. It just always smelled SO good. Plus one of my best friends growing up and I used to always make this before we would settle down and watch a movie (usually Kate and Leopold as we got older). We would use canned frosting to decorate and then there was always a ton of frosting leftover that would get eaten by the spoonful over the next few weeks. Champ over here. I used the cookie recipe I’ve been using lately for cookie bars and then I made the chocolate frosting from scratch. It did make more frosting than I needed for my simple decorations, but I don’t mind. I find once I start making small amounts of frosting, it’s hard to mix it with a mixer. And I don’t think 24 year old Sara and 14 year old Sara would ever complain about having some left over frosting. Nope, not at all. 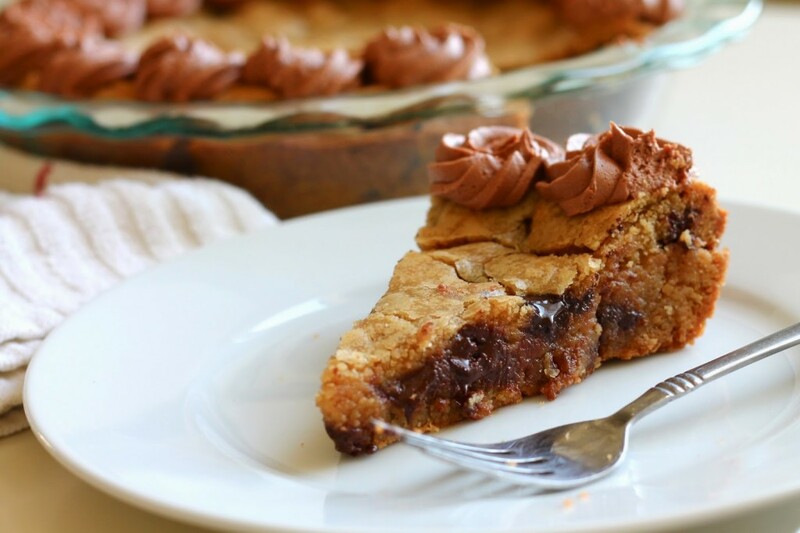 Also, this recipe does make a thick cookie cake. It’s not thin like a slice of thin crust pizza. It’s thick, chewy, and holds up well, especially once cooled. Cutting it up into slices wasn’t a problem. If you need to eat something to make all the feelings go away (I’m looking at you, book) or if you want to bring back your childhood, this is definitely a great way to do it. Preheat oven to 325 degrees F. Take a 9 inch round cake or pie pan and spray with non-stick cooking spray. Set aside. In a medium sized bowl, whisk together flour, cornstarch, salt, and baking soda. Set aside. In a large mixing bowl, beat the melted butter, brown sugar, and granulated sugar together until combined. Add in egg, egg yolk, and vanilla, mixing for 2 minutes on medium/medium-high speed until smooth, silky, and light in color. With the mixer on low, slowly add dry ingredients until just combined. Fold in chocolate chips. Press dough evenly into the pan. Bake for 25-30 minutes, or until the top is a golden brown. Let cookie cake cool before frosting, if desired. 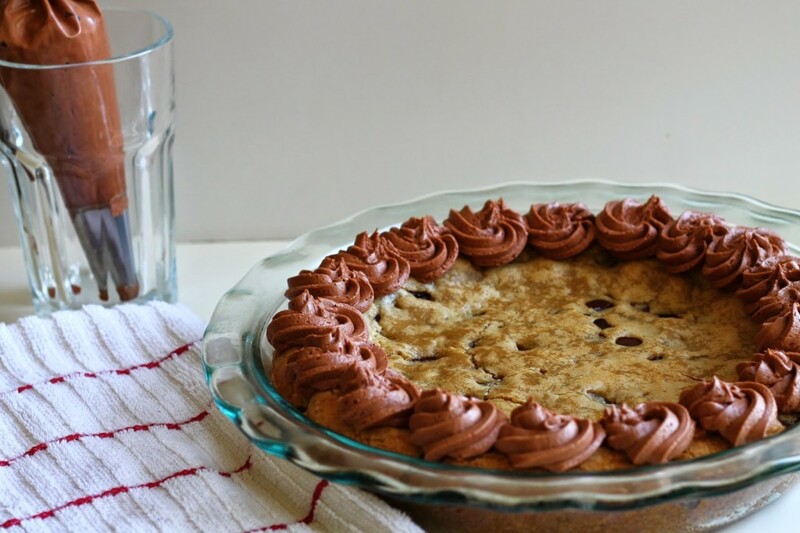 In a large mixing bowl, beat together butter and cocoa powder until smooth and creamy. Add in powdered sugar 1/4 cup at a time, mixing after each addition. Add heavy cream until you reach your desired consistency. Frost the cake however you like! Note: I did have leftover frosting by decorating as I did in the pictures. Leftovers aren’t a bad thing for me – I can make cupcakes for two or just eat it plain. You could probably cut this frosting recipe in half, but I can’t guarantee that half this recipe will be enough to decorate. Yum, the cookie cake looks so tasty! Wow looking very yummy. Thanks for sharing such nice recipe. Chocolates Cakes is my favorite cake all time. I am going to try this recipe. 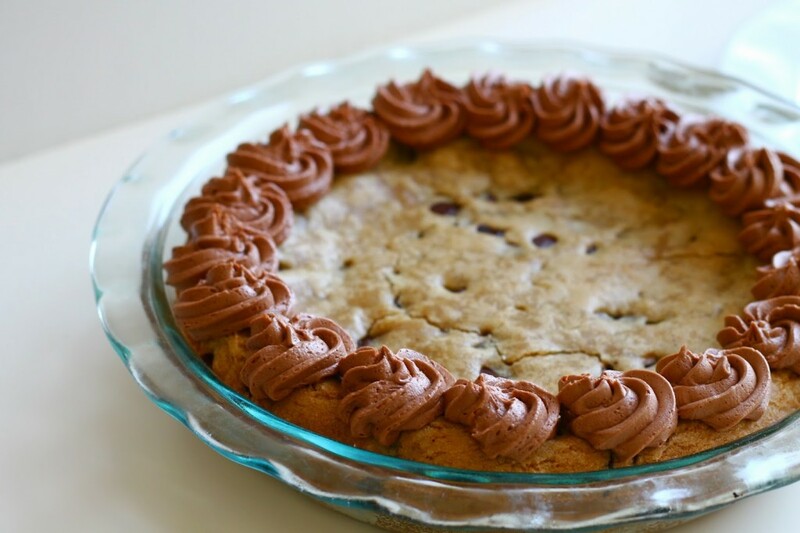 Chocolate Chip Cookie Cake is really delicious and tasty. It looks like superfood chocolate and I think this chocolate cake is healthy too. your blog is really good thanks for sharing chocolate chip cookies is really mouthwatering dish.i never make this recipe at home.now i make this at home with your recipe and please share rasmalai recipe i am also want to make this at home thank you.